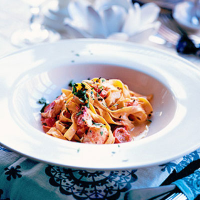 There’s nothing more fast 'n' fabulous than a main course starring the king of shellfish. Talk about minimum effort for maximum wow factor! Remove the lobster flesh from its shells. Chop into 2cm chunks and set aside. Place a large sauté pan over a medium heat. Add the olive oil, garlic and chilli then cook for 2 minutes to infuse the oil with the flavours. Tip in the tomatoes and cook until starting to soften. Add the white wine and cook until reduced by about half. Then add the stock and continue to cook until the liquid has reduced by half. Place the pasta into the pan of boiling water and cook according to pack instructions. Remove and discard the garlic cloves and chilli from the sauce. Toss the lobster flesh into the sauce with the crème fraîche. Cook for 2 minutes until the lobster is hot. Add the drained pasta and parsley, toss to combine and season. Serve with Waitrose Roasted Garlic Flat Bread. This recipe works well with cooked crab too. Increase the chilli if you like it hot. Ask for the lobster to be cut in half at the fish service counter. A full-bodied white is the best match for lobster.